Australia were set a mammoth target of 538 to win after Pakistan declared their second innings at 9-400 late on day three in Abu Dhabi. During the ninth over of the morning session, Azhar Ali's run out in a freakish way while batting on 64 runs is unbelievable for spectators. In freaky scenes, Azhar convened mid-pitch with Asad Shafiq after an edge to Siddle which flew past gully but stopped short of the rope. From the outfield, Starc collected the ball and threw to Australian captain, Tim Paine, who gleefully broke the stumps, to Ali's utter disbelief. Meanwhile, Shafiq and Ali were punching fists while having a chat in the middle of the pitch, thinking that the ball had gone for a boundary. Fox Cricket host Neroli Meadows suggested that some viewers were questioning whether the dismissal was within the spirit of the game, but panelists Waugh and Lee had no issue with it. "Thankfully the other batsmen went in and did the job", Azhar said. 'There's nothing in there that is against the spirit of cricket, that's just proper cricket. "They're playing by the rules, they've done nothing wrong the Aussies and unfortunately the batsman have made the mistake". "Once you start getting into your 30s, mid-30s, you can't afford to have a run like that, because everyone starts talking about your position in the team, is that the end of your career, and that extra pressure builds up on you as well", Hussey said on Wisden radio. 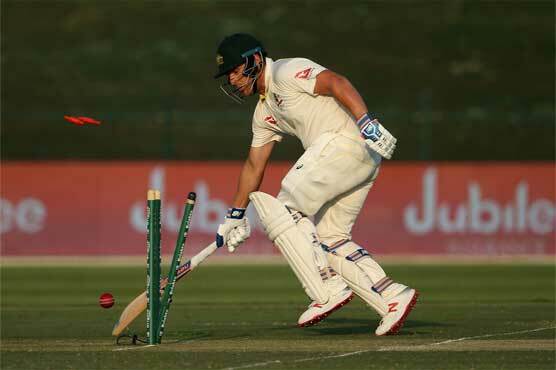 The Australian batsman helped his team get their first wicket of the Test against Pakistan. 'Surely one of the funniest runouts ever, ' one person Tweeted. Pakistan, who were denied victory in the opening match after Usman Khawaja scored 141 in the final innings, pushed their lead over 200 in the final session of day two.